No, this isn’t a career advice article. This is another post from the I-learn-you-learn department. WebWorkerDaily turned me on to Where’sMyCellPhone. What does it do? Just that. And only that. Helps you find your cell phone. You go to the site, input your cell number and the service rings your phone. Why is this useful? 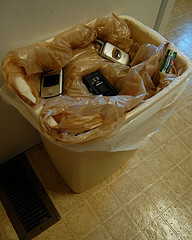 Well, if you’re like me and you’re misplacing your cell phone all the time, the first thing you think to do is ring up the phone so the ring tone will lead you to the right pile of dirty clothes your phone is hiding under. And if you’re like me, you don’t have a landline anymore. So, if you lose your phone and you’re all alone in your house… well, you can’t very well call someone up and have them ring the phone for you can you?